"Besides being a delicious and comforting winter meal, this roasted apple and parsnip soup is great for honing your seasoning skills. With its mild, earthy, slightly sweet, gently aromatic flavor, it's the perfect vehicle for tasting the effects of salt on food. 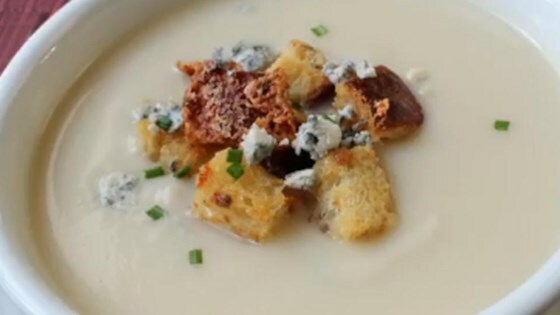 Garnish with croutons, crumbled blue cheese, and chives." Spread parsnips and apples out onto prepared baking sheet. Drizzle olive oil over the top and sprinkle with kosher salt. Toss to coat. Roast in preheated oven until parsnips and apples are tender and caramelized around the edges, about 30 minutes. Stir apple-parsnip mixture, chicken broth, and potato together in a large pot; bring to a boil, reduce heat to low, and simmer until potatoes are tender, about 30 minutes. Puree apple mixture with an immersion blender until soup is smooth. Stir cream into soup and season with cayenne pepper and salt; cook until heated through, 2 to 5 minutes. You can use a mixture of chicken broth and water instead of only chicken broth, if desired. A diced yellow onion could be added to the roasted vegetables. I didn't want this too sweet, so I tried without one, and it was amazing, but I'll try the next batch with that addition. Added a roasted onion and instead of adding heavy cream I topped it with some crème fraîche and chives. It was deliciously warm and comforting and I fell asleep soon after consuming it! It was bland with a color and consistency that reminded us of baby food. Very little flavor - I would not make this again. I used 4 cups chicken broth & 3 cups water. Added 1/2 teaspoon salt at the end.